iNameHost Review 2019: Is iNameHost a Good Hosting? iNameHost is a Bangladesh-based hosting company which specializes in offering low-cost datacenter solutions to business organizations. Established in 2015, the hosting company markets itself as an affordable web hosting firm for businesses of all sizes. iNameHost was founded in 2015 and has since been offering data center solutions to businesses in Bangladesh. The company has its offices in Dhaka, Bangladesh. It markets itself as a cost-effective option for businesses seeking quality web hosting solutions and its hosting solutions include shared web hosting, VPS hosting, SSD VPS hosting, and dedicated servers. iNameHost web hosting solutions support both Linux operating system and Windows Server 2012. The vendor uses cloud-based servers with 100% enterprise-grade SSD disks for lightspeed performance. This hosting provider offers four shared hosting packages: Prime, Plus, Premium, and Ultimate. Prime is the basic shared hosting package. It comes with 1GB SSD storage and 30GB monthly bandwidth along with a noteworthy number of unlimited features including unlimited MySQL, unlimited FTP, unlimited emails, unlimited subdomains, and unlimited add-on domains. Ultimate, the vendor’s most advanced shared hosting plan, comes with 10GB SSD storage and 300GB monthly bandwidth. I found it quite impressive that iNameHost offers quite a number of free premium features. The vendor also has a special, unlimited hosting package that comes packed with features that have no apparent restrictions. What’s more, this hosting firm’s hosting solutions include a one-click installer to help you install and create your blog, forum, CMS, wiki, and so much more in a single click. The vendor’s cPanel is modern and intuitive and comes with a Paper Lantern theme. The notable security features that iNameHost includes in its hosting plans include Imunify360 Intrusion and Malware protection and SpamExperts SPAM Protection. In addition to all these, users get free regular offsite backups. The fact that iNameHost’s hosting solutions come with an array of free and unlimited features makes its hosting plans pretty cheap. The vendor offers a 99.9% uptime guarantee but does not offer a compensation plan in the event that the it fails to live up to this promise. Although the vendor claims to not tie its customers into long term contracts, its shared hosting solution has an inflexible payment plan; users can only subscribe to these plans on an annual basis. 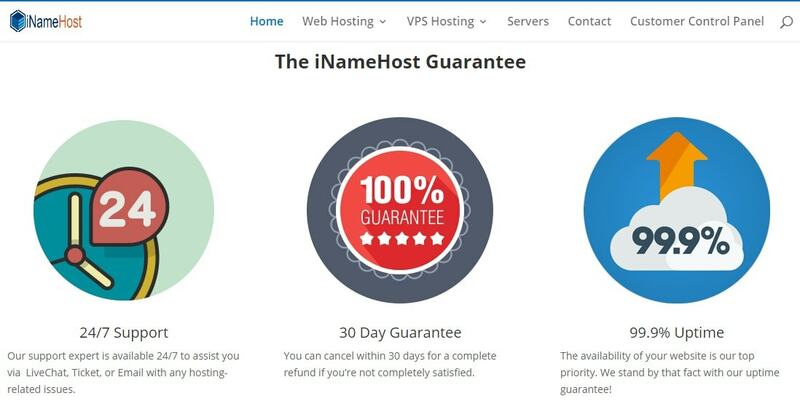 iNameHost also offers a 30-day money-back guarantee. For assistance, iNameHost’s technical support is available via telephone, email, and ticketing system but no live chat. The vendor says that its customer desk is available 24/7 to assist you whenever you need help, though my experience was quite different: I sent them a support email and never got a response. The vendor has not invested in a knowledge base to help its customers solve hosting-related issues without contacting their support team. This is especially a problem given the fact that its support team is practically non-existent. At first glance, iNameHost seems like the hosting provider of choice for a business of any size in Bangladesh. However, the vendor’s apparent failure to invest in its customer support team is a big letdown. It is, perhaps, a big part of why many businesses opt for other vendors even though the solutions that this host makes available could be ideal for their websites. Wondering how iNameHost stacks up against other Web Hosting companies? Enter any other Web Hosting company and we will give you a side-by-side comparison.